Carnival Glory has changed. In November 2012, it underwent an important re-vitalization dry dock which added new venues to her public areas. More than just physical changes, these new features allow the ship to present the cruise experience in a different way than in the past. Glory's changes were made as part of a fleetwide program called Fun Ships 2.0. Inasmuch as Carnival Cruise Lines is, and has been for time, the world's most popular cruise line, the question becomes why make changes at all? The Amber Palace is the Glory's main entertainment venue. While at first glance this large theater may look the same as it always has, there has been a significant change. On stage, the traditional scenery and backdrops have been replaced by large LED screens. During a show, instead of a static drawing on a backdrop, the LED screens change constantly, showing different images, scenery and patterns. In addition, they can be moved around the stage. In addition, without the 20 to 30 backdrops that had to be stored backstage, the Amber Palace can be used for additional types of entertainment and as will be discussed later, new entertainment concepts. Most importantly, the LED screens make for a more exciting guest experience, “There is more light now on stage. They are brighter, nicer, up-to-date. They are much better for the guests,” confided Mr. De Lange. 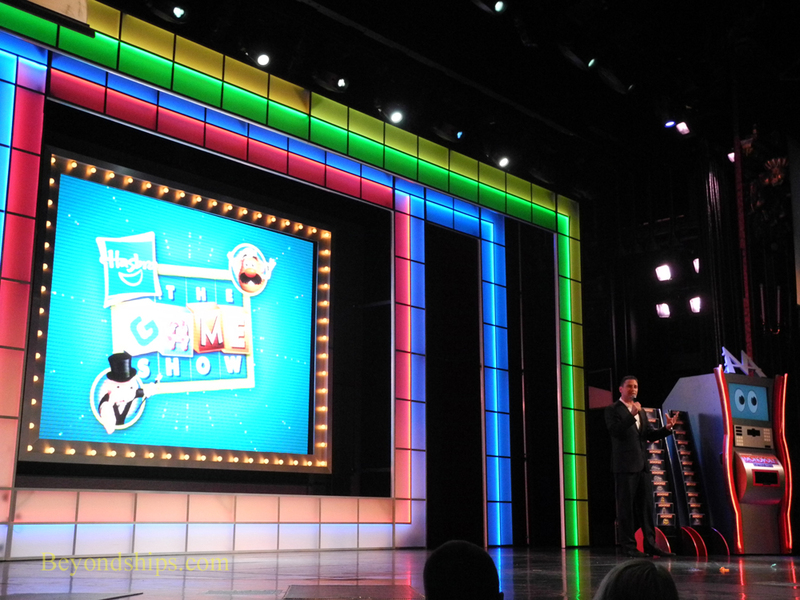 The theater is also being used for another new entertainment concept called “Hasbro, the Game Show.” Here, the cruise director selects guests from the audience to compete on stage in contests adapted from the popular Hasbro board games. The theater is set like a television studio with the guests as the studio audience. It is particularly popular with young passengers. Cruise director Jacques De Lange hosting Hasbro The Game Show in the Amber Palace theater. Also for young passengers is the Towel Animal Theater. “It is a totally brand new concept. Its like the Muppet Show. It is more a family show but it is funny even for the older crowd. Something different.” Mr. Lopez noted. The show begins with a demonstration on how to make animals out of towels like the room stewards do in the guests' staterooms each night. Children get to sit on stage and participate in making animals. Following the demonstration, the animals come alive in a puppet theater on stage. The theater was not the only entertainment venue to see change. Glory's other large venue, the Ebony Lounge, now hosts Punchliners Comedy Club. Here, the changes are not so much physical changes but rather conceptual changes. “The quality of the entertainers is a lot better now especially with the assistance of George Lopez. Very contemporary,” Mr. Lopez added. On a typical cruise, Glory will have five comedy shows a night on the sea days; three family-friendly shows and two adult shows. Two comedians alternate performing the shows. On longer cruises, the two comedians who begin the cruise are usually replaced by two other comedians in one of the ports of call. In addition, to make the lounge feel more like an actual club, there is a comedy club host who greets the guests and acts as the MC, introducing the comedians. Also, the ship has implemented a bar menu that is exclusive to the comedy club. It is based upon Carnival's research into what drinks people want at comedy clubs. Not all the changes are inside the ship. The main pool area is also an entertainment venue. During the day, there is music for the guests to listen to while relaxing in the sun, swimming in the pool or partaking in other outdoor activities. “We used to have an island band or a calypso band. They can only play so much music. Now the DJ is up there. We have provided them with thousands and thousands of songs, different themes. They can read the crowd - - do they want country music, do they want relaxing music? They get the guests involved in activities and dance offs. The DJ provides a whole variety [of ways] to get the guests going all day long.” Mr. De Lange pointed out. Overlooking the main pool area is a giant LED screen. “In the evening, it turns into Seaside Theater. We give the guests blankets and complimentary popcorn” while they watch movies, concerts and classic television favorites.